my view is Montuhotep ii! i think he ruled at a very critical phase in AE history. Yet not much is known about him. IMO none of the Middle Kingdom Pharaohs get the attention they deserve. The Montuhoteps pulled Egypt back together after the First Intermediate period and the Amenhemets and Senuserts of the 12th dynasty took it to new heights. They do deserve much more press! Excavations at Deir el Bahri told us some interesting things about Montuhotep III's domestic life. One queen, several ladies who may have been secondary wives or concubines, AND sixty or so soldiers, probably battle casualties, honored with burial near their king. ... Excavations at Deir el Bahri told us some interesting things about Montuhotep III's domestic life. One queen, several ladies who may have been secondary wives or concubines, AND sixty or so soldiers, probably battle casualties, honored with burial near their king. Der Tempel Mentuhotep III. auf dem Thotberg. I gather there's some confusion over exactly how many Montuhoteps there were and which did what? I admit I wasn't at all sure whether the Deir el Bahri temple belonged to number II or III. In the ancient Egyptian chronology today it is now believed in the existence of a Mentuhotep as the progenitor of the 11th Dynasty. This one gets the count "I". From his government, presumably as a nomarch of Thebes, there is no contemporary evidence. He bears the unique title "Father of the gods". The title godsfather (without a special gods name) was in MK for non royal fathers of kings in use. So it is believed that he is the father of Antef I and II (Antef II donated a statue of him in the sanctuary of Heqaib on Elephantine). Retrospectively assigned to him is the royal dignity. In the King List of Karnak (Thutmose III) his name appears in a cartouche, his horus name is "tepya" ("The Ancestor"). He also was listed in the Turin Canon but the name is partly destroyed there. Hi Lutz. That's a great map! Can you tell me where you got that? Also, is it accurately drawn to scale? 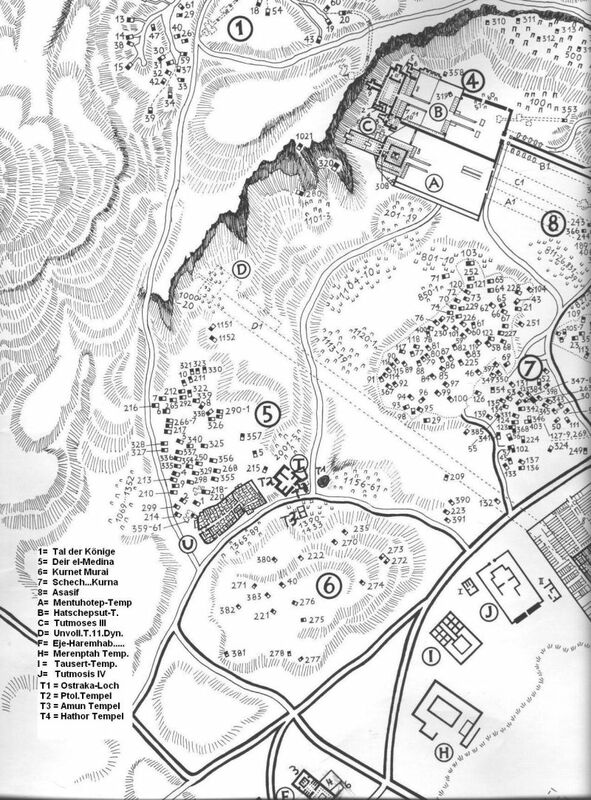 This is an excerpt from a map of the Theban necropolis, her title is "Die Nekropole Theben-West". The map is about 90 x 60 cm and was created in 1972 by Gerhard R. Hauptmann on the basis of the "Topographical Bibliography of Ancient Egypt" by B. Porter and R. L. B. Moss. As far as I know it is to buy only in the museum shop of Berlin's Egyptian Museum, for 10, - Euro. I think it is more or less drawn in scale. If I'm around in Luxor I always have a copy folded up in my backpack. Since it is not only practical but also decorative another hangs over my desk, right behind me. Thanks. It's a really nice map. I think the most underestimated pharao is Khufu. First Pyramid with hieroglyphs in its highest part: Khufu, meaning: high/great. I think drunkards of Khufu should be translated as Osiris-Khufu. The sacred secret secured in the Ziggurat. My vote for the most underestimated Pharaoh (actually known as Kings at that time) would have to be Narmer (aka Menes most probably). This is the man who united Upper and Lower Egypt under one rule, creating the First Dynasty. I may be biased due to mt trilogy about the First Dynasty, but I do think a solid argument can be made over his contributions. He was also revered by all subsequent dynasties. In fact, he was so revered, for many generations Egyptologists thought he was mythical. I am happy to report that Qa'a should be out this Fall. I finished it and have nursed it through two drafts so far. It's so exciting to be immersed in that time period between the First and Second Dynasties. If you haven't done so yet, please try The First Pharaoh and The Dagger of Isis, so that you are prepared for Qa'a when it arrives! Congrats! Lester when is it out on audio? and what are your next books?